The witness asked not to be identified for fear of ridicule. She said, “I’m not saying it was a Bigfoot. It had really long arms and long legs. It was completely solid black (thus nothing to indicate lighter clothing or skin). It crossed the two lane road in only a few steps, swinging its arms dramatically.” It was estimated at a little over six foot tall. She was travelling at 60mph and the object crossed just beyond her headlights. Although it was dusk, she could still see fairly well. As she approached the spot where it crossed, she slowed down just a little and looked. She totally expected it to be walking away from the road, but it completely disappeared. The sighting was odd enough that she immediately called her husband and told him what she just observed. This spot is about a quarter mile from an elementary school. The surrounding area consists of very dense forest as you can see in the above picture and the Cumberland River is very close. Investigator’s note: I can appreciate the witness wishing to remain anonymous. Even today, too many witnesses are ridiculed. I also find it significant that she knew right away "the individual" did not appear to be a person, due to it being completely black with abnormally long, swinging arms and long legs. Although the height is that of a man, not all Bigfoots are 8 foot tall. 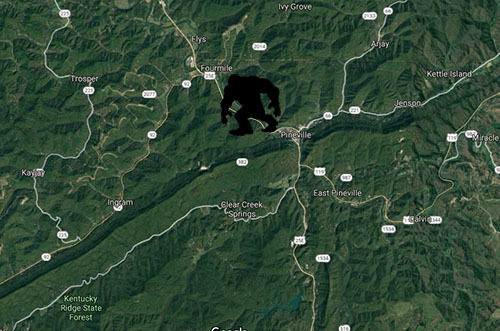 Per another witness: "This is only 2 or 3 miles north of the encounter/sighting I had, and about 6 miles north of the Sasquatch I seen laying in the ditch late one night. That mountain range is Pine Mountain, and you can go almost anywhere you want to go in the county on that mountain and without anyone ever seeing you. The new sighting is exciting to read, I guarantee that there would be more reports from that area if people wouldn’t be afraid of ridicule." I contacted Thomas Marcum of The Crypto Crew since he lives very close to this location. He was able to meet the witness at the sighting location and provide this nice, follow-up investigation: The Cryptid Crew report. “Back in 2002 I was on the mountain hunting ginseng. It was early Oct, clear crisp morning. I was on Pine Mountain and had covered a lot of ground. All that morning I felt that something was following me. From time to time I could smell a foul scent in the air. I could hear something walking ever so often but I couldn't see anything. About four hours later I found a really nice four prone and started digging. In the thicket behind me I could hear something moving through it, and it would shake it violently and making loud grunts and low deep growls. As I stood up it got louder and charged through the brush. I turned and ran down the mountain and moving pretty fast, I came to a group of three inch thick trees that I hoped would slow it down." When he finally saw the creature it was approximately 30-40 feet away. The hair was reddish-brown and he didn't see facial features. Shape of the head was slightly pointed or coned. He estimated the shoulders at about 3 1/2 foot wide. The visual sighting lasted maybe 3 to 4 seconds. 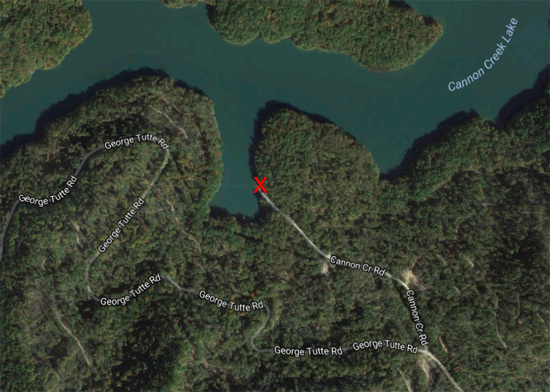 The exact spot was located between Greasy Creek and the Cumberland River. Billy has been a long-time friend and he is very credible. The witness was 14 years of age at the time of the sighting. He is 39 years old now. Over the years nobody believed his story, thus he stopped sharing it. 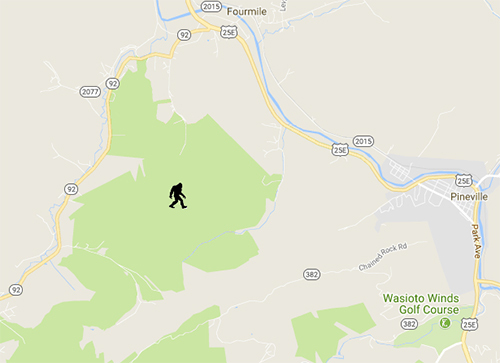 Recently he decided to Google Bigfoot sightings in KY after rehashing his sighting with his mother, so he sent us a text. Michael was tent camping with some cousins at the edge of Cannon Creek Lake. Two tents were placed at the junction of the road and lake. They were the only ones camping at this location for two nights. On the morning of the sighting, Michael was the first one to wake up. As he crawled out of his tent he looked through the (still smoldering) campfire and noticed a large creature hunched down by the water. He could not tell if it was drinking. It was large and dark brown. At first he thought it was a bear. As Michael stood up, the creature also stood up. The creature also turned away in the opposite direction as it stood upright. It "very casually" walked away on two legs. It had long arms and walked slightly hunched over. “It never looked in my direction and walked slowly, like it didn’t care. It had dark brown, matted hair which looked like it was wet,” explained Michael. It walked up the road and disappeared into the treeline. The overall shape was similar to most Bigfoots: long arms, wide shoulders and stood about 7 to 8 foot tall. However the arms did not have an exaggerated swing, it walked slow. The entire sighting lasted less than a minute. They did not go look for tracks and they did not leave immediately, because his cousins did not believe him. "Well at the time me and a friend where working 3rd shift in Corbin KY so we would meet up at my house and car pool to work. We pulled out on to highway 25 towards Corbin and about a mile before crossing the bell co/Knox co line when we see something. i was driving along not really paying attention to much when all of a sudden my friend almost jumps in my lap as we pass by something that was big and hairy walking on two legs i swerved my truck across two lanes almost running back off the road on the other side. We were too scared to turn back and have really kept this to ourselves because we thought people would think where crazy." Describe the creature with detail: Big with dark fur walking on two feet.